FPU: 68881 or 68882 (PLCC or PGA) at the same speed as the processor. An accelerator for the A2000 which plugs into the CPU Fast Slot. 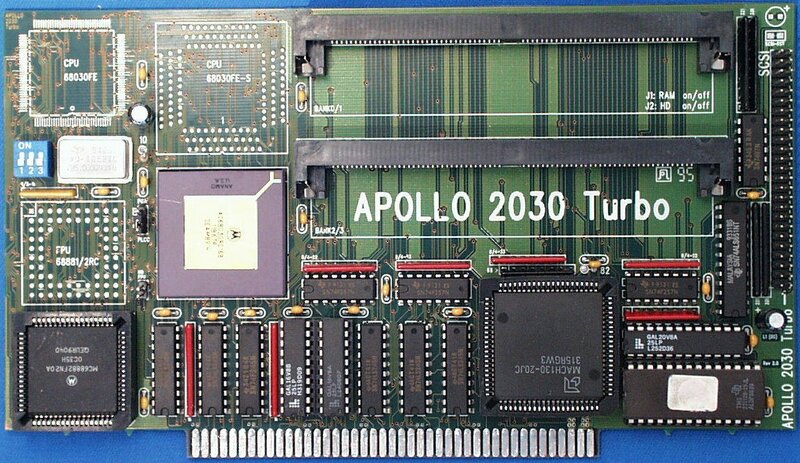 The card also has SCSI-II onboard and includes an internal 50pin connector, however external SCSI devices can be attached by using an additional adaptor. There appear to be two slight variations of this card. The first type uses DIP switches for SCSI/RAM configuration, lower profile SIMM sockets and has more mounting areas for the CPU and FPU. This is probably a newer revision of the card. The other type uses Jumpers instead of DIP switches and has higher profile SIMM slots. Note: To use the Apollo2030 you need at least Kickstart 2.04 or greater. With Kickstart 1.3 this card will not run.